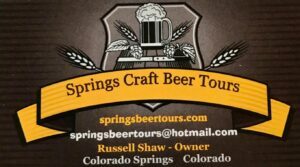 Here you will find articles and information about Springs Beer Tours and our unique walking beer tours and services. We will also be posting information about, Colorado, the Manitou Springs and Colorado Springs area and the craft beer industry. The Springs area offers an amazing array of activities including hiking and biking trails, wildlife watching, horseback riding, zip lining and a world-class zoo. And don’t forget the spectacular scenery of Garden of the Gods and, of course, America’s mountain, Pikes Peak. Oh, and did we mention that our area offers some of the best craft beer in Colorado. Sign up for a tour,or book a private tour, and taste some amazing craft beer, get a bit of history about the town of Manitou Springs and all of this in the shadow of Pikes Peak! I look forward to sharing a beer with you! After a long drive from Boulder to Colorado Springs, the first stop was one that was going to quench my thirst…with beer of course. 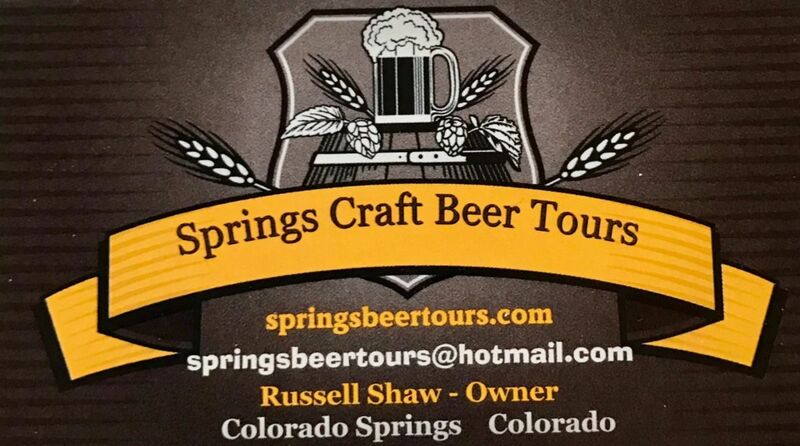 We met Russel Shaw of Springs Beer Tours at Creekside Cuisine to begin a 2-hour walking tour of the quaint mountain town of Manitou Springs (6 miles west of Colorado springs). Russel is a retired Service Disabled Veteran who served in the U.S. Air Force for over 23 years. 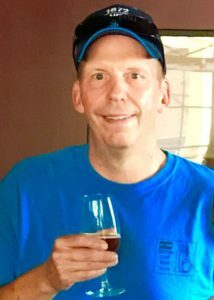 He has been a resident of Colorado Springs since his retirement and has a strong knowledge and passion for craft beer and history. It’s the most wonderful time for a beer! Truer words have never been spoken. Winter beers are typically a little stronger, richer and full bodied. Our December tour promises some great Santa inspired beers! We know that he loves “Winter Warlock” from Bristol Brewing Company. Who doesn’t remember the Winter Warlock from “Santa Claus is Comin’ to Town!”? We’ll have that namesake Oatmeal Stout on the tour to help keep you warm on our walking tour of Manitou Springs. We will also feature a “Shake” Porter from Boulder Brewing Company on nitro. Instead of CO2 we use nitrogen which gives the beer a creamier and smoother feel. Nitro can also lessen bitterness in the brew. Give it a try for the holidays! 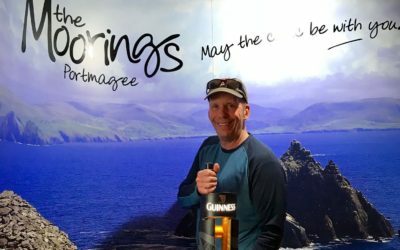 I have just returned from Ireland and it was a great experience to say the least. The people, the food and the beer were all outstanding. Of course I had to take the Guinness Storehouse tour and enjoy a stout high above Dublin. However, I was pleasantly surprised to see that Ireland has branched out.There were lots of Ireland brewed lagers, IPAs and pale ales available in local pubs not just Guinness and Murphy’s beers. It’s obvious that craft beer is here to stay all over the world. 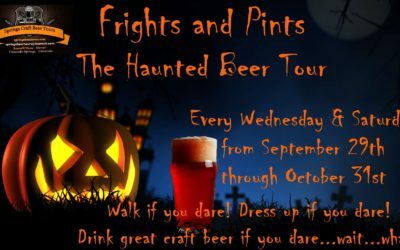 Our Frights and Pints Haunted Beer tour will feature some German and Fall inspired craft beer selections. check out our “Tours” page for the full schedule. See you there! Get ready for Thrills and Chills…chilled beer that is. This version of our original Manitou Springs walking beer tour features Colorado craft beer selections from Creekside Cuisine, Red Mountain Bar & Grill at The Cliff House and our final stop at Manitou Brewing Company. This walking beer tour makes its way through the streets of Manitou Springs beginning at 3PM. In addition to sampling some of the best craft beer that Colorado has to offer, our guide will also take you by some of the popular haunts of our local ghosts and goblins in Manitou and, share insights about the town from Zebulon Pike’s first visit back in 1806 through today! Like Manitou Springs, this walking beer tour is unique. As long as there has been a meal on the table, there has also been the need to have an accompanying beverage on hand. While the ins and outs of what is on the menu have changed over the course of time, right now, the hottest beverage around is craft beer. 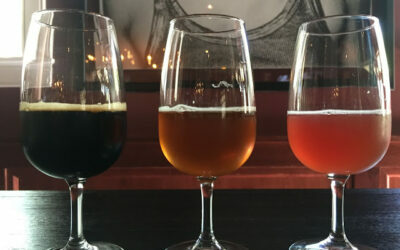 The small-batch, hand-crafted, detail-oriented world of craft beer has not only drawn many admirers of great beer, it has also piqued the interest of foodies the world over regarding the possible pairings that could be made with their favorite foods. It’s easy to see why the idea of pairing a good craft beer with certain foods would be of intense interest. Think of craft beer in the same way you’d think of wine. In the same way that certain flavor notes in wine go really well with certain foods, so, too, does well-made beer. I did my senior year of college at the University of Edinburgh, where it was common practice for recitation and study groups to convene for deeper dives at the pub. I’m not saying the habit was integral to my appreciation of Scottish history or Shakespeare’s “The Winter’s Tale,” but I will tell you this: Learning about history or literature over a delicious pint in a place that was around when those events occurred or those words were written sure beats doing it under fluorescents over Irn-Bru at the library. © Copyright 2019 Springs Beer Tours, LLC - Design by Wayne.